The mission of the UCLA X-ray Crystallography Core Technology Center is to provide state-of-the-art resources to researchers at UCLA., enabling the detailed 3-D analysis of biological macromolecules that play essential roles in human health. The facility operates as a full service core that not only offers access to sophisticated equipment and technologies, but also offers advice and technical assitance in sample preparation, data collection, processing, atomic refinement and modeling. The purpose of the X-ray Crystallography Core Facility is to provide equipment, training, assistance, and technological innovation for determining 3D atomic structures of proteins and other macromolecules. The X-ray Facility conducts original research in developing and improving crystallographic tools, and helps scientists determine atomic structures. Each structure determined using the Facility not only yields insight into biochemical pathways, but also expands databases used for improving algorithms for fold assignment, structure verification, atomic refinement, potential energy functions, and analysis of protein-protein interactions. Services provided by the Facility include: aid in crystallization; X-ray characterization of crystals; X-ray data collection in-house and at the synchrotron, processing and quality analysis of data; and structure determination and display. 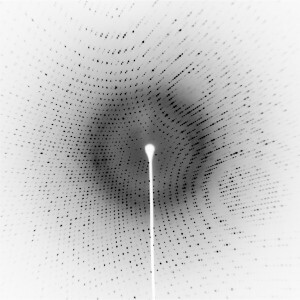 Providing experimental and computational facilities for X-ray based structure analysis and refinement, and for supporting structure determination by crystallography, and computational methods.Acquisition of X-ray diffraction data using in-house high brilliance generators. X-ray diffraction data processing and manipulation. Assistance with the macromolecular model building and structure refinement processes. Guidance in the interpretation of the resulting three-dimensional macromolecular structures. Web-based services that include tutorials and software tools to assist users. Workshops and informal classes introducing the fundamentals of single crystal X-ray diffraction work to potential users. These workshops also provide an overview for how the core functionsand how users may interface with Core personnel. Micro crystallography: rapid screening of micro-crystals with the UV microscope. Manipulation and dissection of micro-crystals with a micro-manipulator. To recover the cost of the supporting personnel, consumables and service contracts for the equipment, a fee will be charged to researchers. The fee structure is designed to divide the ongoing costs among anticipated users, based on usage of the facility. This usage covers numerous activities: x-ray data collection, machine maintenance, data collection at home, travel to synchrotrons and data collection there, expert assistance with structure determination (e.g. molecular replacement, heavy atom phasing, refinement), coordinate deposition, structure interpretation and analysis, and figure and manuscript preparation. A point system of a unit has been developed to assign usage to participating research groups. INTERNAL X-RAY SERVICE (UCLA) will be charged $90 per unit. EXTERNAL X-RAY SERVICE ( NON-UCLA) willbe charged $135 per unit. A PI should anticipate a charge of around 20 units per quarter to use every instrument, and materials available in the facility including: FRE+ X-ray generators, HTC image plate detectors, High Power Leica Microscopes with High Resolution CCD Cameras, Korima UV microscope, all Cryogenic Equipment, storage of crystals in Liquid Nitrogen Dewars, storage in the 5 degrees Crystallization Room, data collection at the synchrotron and experienced staff assistance with structure determination. New users should discuss setting up a recharge account with the X-ray Core Director. The X-ray Crystallography Core collaborates with the Crystallization Core and Protein Expression Core to offer the advanced technology and expertise our users rely on. The X-ray Crystallography Facility is located in Boyer Hall with a total area of 1200 square feet. The facility presently operates 2 rotating anode generators: The Rigaku FRE+ and FRD generators. The FRE+ rotating anode generator is used with 2 HTC detectors and varimax confocal optics. The FRD rotating anode generator is used with an ADSC-Quantum4 CCD, a Raxis4++ imaging plate detector and confocal optics. Crystals are cooled at 100 K by four X-tream Liquid Nitrogen cryogenic coolers. All generators are shielded from humans by leaded glass enclosures. The facility is kept at 20 °C by two independent air conditioning systems. The cold room also is equipped for crystal growth and mounting of heat-labile crystals. The compressors and water recirculating coolers used to remove heat from the x-ray generators are kept in the small room 116, to isolate the noise from the rest of the facility. The facility operates in two modes: In the first mode, trained users carry out all aspects of the crystallography experiment from crystallization to data collection and analysis. Every year, approximately thirty graduate students and new postdoctoral fellows are trained in part through classroom and laboratory instruction in the course M230D, Structural Molecular Biology. In this course, every student grows ProteinaseK crystals and receives introductions to data collection and reduction, cryocrystallography, and model building and atomic refinement. In the second mode, a member of the X-ray facility assists the researcher in the steps of structure determination in which he is inexperienced. The scheduling of equipment is the responsibility of the Manager. Users sign up on the scheduling board in the X-ray lab. The schedule of each instrument is adjusted to optimize the useful time of each detector and to permit special time for crystallographic problems of unusual difficulty. If a user needs extra time to finish an experiment, the time is usually granted, depending on other needs and constraints. The X-ray Crystallography Facility dates to before 1980. It has gradually been built up from NIH (1980-2006) and UCLA support, and since 1993 with DOE support. In 1980, the facility operated with two Elliott GX-6 and one GX-21 rotating anode generators, equipped with several precession cameras and an oscillation camera. In 1981, Richard Dickerson joined the UCLA faculty and brought with him a Nicolet diffractometer. In 1983, a multiwire area detector was purchased from San Diego Multiwire Systems (Serial Number 001), and in 1986 a second multiwire panel was added and shifted to a new Rigaku RU-200 generator. In 1987, the Nicolet diffractometer was replaced with a Rigaku AFC-5, and in 1989 a Rigaku RU-200 was purchased for precession camera work. In 1991, a RAXIS-II imaging plate was installed for use with the newest generator. Most of this equipment was purchased with NIH funds, with matching funds from UCLA. In 1993, the UCLA-DOE Lab was refocussed within a new Division of Structural Biology and Genetics, and DOE funds permitted purchase of a second RAXIS-II with double collimating mirrors. In 1996 an RAXIS-IV with mirrors was installed, and the multiwire system was phased out. In 1999 with support from the Keck Foundation, a high flux x-ray FRD generator with confocal mirrors and goniostat and a Quantum-4 ADSC charged coupled device (CCD) with confocal mirrors was installed. In 2009 a High Flux Rigaku FRE+ generator was installed with two Rigaku HTC imaging plates using funds from NIH, DOE and HHMI. In 2000, the Facility recruited a superb teacher-scientist, Dr. Michael Sawaya, whose duties include working with students and postdoctoral fellows in determining crystal structures. Dr. Sawaya is an experienced crystallographer, interested both in crystallographic methods and in teaching them to others.